Being an outstanding educator today is not just about good teaching and great facilities. It demands a well-oiled machine that runs like a business, delivering transparency in everything you do, keeping up-to-date with significant and far reaching regulatory change, adequately funding your increasing student population and infrastructure needs, and satisfying student and parent expectations of technological excellence. Realistically, who has the time or the skills to do all of this, and do it well? If you answered “certainly not me”, then you’re not alone, especially without the right support to make it happen. At Moore Stephens, we’re education specialists, supporting over hundreds of educational institutions, independent and catholic schools, and performing arts organisations across Australia. So, there are few issues in education we have not seen or successfully dealt with. 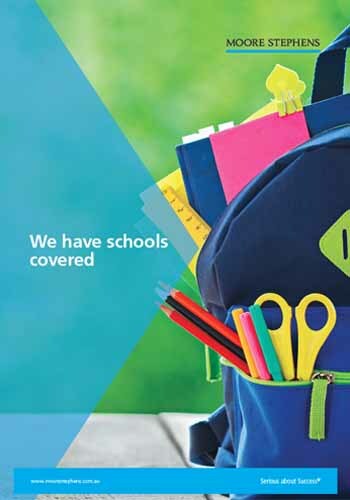 For more information about our education services, download a copy of our brochure by clicking here or reach out to us by clicking here. Bursars - what accounting changes are on the horizon that may affect your school? What does your size say?